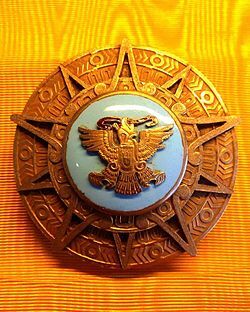 The Order of the Aztec Eagle (Spanish: Orden Mexicana del Águila Azteca) is a Mexican order and is the highest decoration awarded to foreigners in the country. It is the highest honor in Mexico. Recipients include Dwight D. Eisenhower, Elizabeth II, Nelson Rockefeller, Ted Kennedy, Cesar Chavez, Bill Gates, and Nelson Mandela. The order was created in 1933. It was created by decree on December 29, 1933 by President Abelardo L. Rodríguez as a reward to the services given to Mexico or humankind by foreigners. It is similar to awards given to Mexican citizens such as the Condecoración Miguel Hidalgo or the Belisario Domínguez Medal of Honor. It is given by the office of the foreign minister on the instructions of a Council established for this purpose headed by the President. ↑ "DOF - Diario Oficial de la Federación". Dof.gob.mx. Retrieved 18 December 2014. ↑ "DOF - Diario Oficial de la Federación". Dof.gob.mx. Retrieved 28 December 2016. ↑ "DOF - Diario Oficial de la Federación". Dof.gob.mx. Retrieved 29 December 2016. ↑ "Benoît Hamon, grand aigle aztèque et "fier" de l'être". LCI. November 6, 2015. Retrieved January 26, 2017. ↑ "- Awards/ Special Honours". Placidodomingo.com. Retrieved 18 December 2014. ↑ "Mario Vargas Llosa: Mexico me abre los brazos en vez de censurarme". Mexico.cnn.com. 4 March 2011. Retrieved 18 December 2014. ↑ "Mexico Welcomes Rick Bayless into the Order of the Aztec Eagle". Food & Wine. Retrieved 18 December 2014. ↑ Exteriores, Secretaría de Relaciones. "Stuart Gulliver, Group Chief Executive of HSBC Holdings, Decorated with the Mexican Order of the Aztec Eagle". gob.mx (in Spanish). Retrieved 2017-11-16. This page was last changed on 9 April 2018, at 06:26.